Photographed in our clients Sussex cottage, our Wilmington bespoke small 'light form' oak refectory table, with a set of four French oak country chairs and two carvers. The table was custom made to the most appropriate size, for the chairs, and available room space. 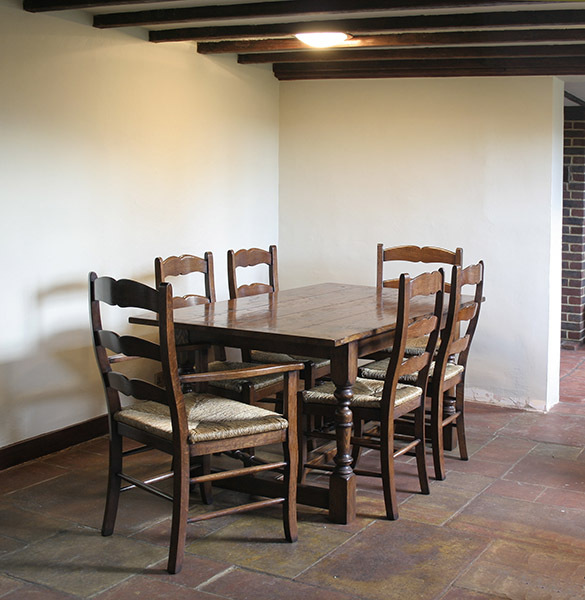 This dining set was also custom finished, in between our 'Raw Sienna' and 'Wash Back Antique' colours. At the request of our client, we also applied a matt sealer coat, then waxed, so slightly duller than a traditional French polish finish.